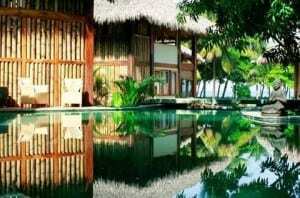 Pranamar Villas & Yoga | Pranamar Villas & Yoga | Yoga Stretches for Surfers ... Practice in Costa Rica! Most surfers are probably already aware that the practice of Yoga results in great benefits for the physical body and beyond. Yoga increases mental clarity and our ability to concentrate with intention on specific goals and desires. The breathing techniques used in this ancient science are amazing for increasing lung capacity, while helping to lengthen our ability to retain the breath (so necessary for surfers). On a physical level, the postures (asanas) create flexibility, tone, strengthen, and hone in on our balancing skills. They also fill the body with vital Life energy (prana) and highly raise our body and self-awareness. The following dynamic and static postures will help you achieve the strength and flexibility needed out in the surf, and will increase your balancing abilities for greater stability on your board. 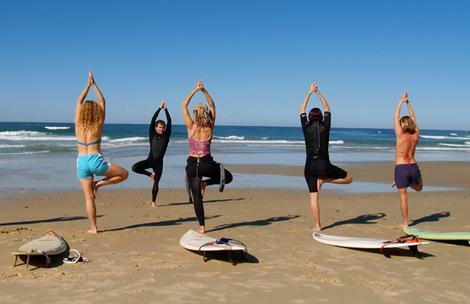 Remember to always warm-up before heading out to the water, stretch for 5-10 minutes after surfing, and ENJOY!! Begin in downward-facing dog pose with your hands outer shoulder distance apart and feet parallel to each other, at least hip width apart. As you lift your hips up and back you’ll begin to feel a deep stretch along the backs of the legs. Remember to engage and tone your quadriceps (fronts of the thighs) while moving the tops of the thighs toward the backs of the legs. Breathe deeply in and out through the nose and throat, balancing the flow of breath and helping to calm the mind. Keep the arms strong and stable by pushing all four corners of the palms and all the fingertips into the ground and begin to lift your right leg up and into the air behind you. Lengthen through both legs as you take the right hip higher, “stacking” the hips and gently twisting from the waistline. Carefully bend the right knee while flexing the foot and spreading out the toes. The more you take your foot to the left, the more you will need to tuck your pelvis to lengthen the lower spine and increase flexibility in the psoas muscles. Work up to holding the position for 5-15 breaths. Bring the right leg back to downward dog posture and repeat on the other leg. Begin standing upright and cross your right ankle over your left lower thigh (right above the knee), keeping the foot active and flexed to protect the knee joint. With your hands on your hips, slowly bend your standing leg and widen your inner thighs back and apart (imagine you are hovering over a chair!). Bring your arms parallel to the earth, reaching long from the heart center to your fingertips. Then cross your right arm under the left and “wrap” the arms around each other. Energetically lift your elbows and fingers upwards, while dropping your hips and thighs. Hug strongly into the mid-line with the legs and breathe deeply for 5 -10 breaths. Release and try the other side. Begin with your knees and forearms on the ground, making sure that your forearms are parallel to each other and shoulder distance apart. Look toward your navel and bring your awareness to your core center, the seat of inner strength and stability. Breathe into your back body from the base of the spine all the way up toward the crown of the head. As you do this you will feel your lower abdomen activate and draw inward toward the spine (away from the floor). Then actively move the tailbone towards the heels, walking your feet back to straighten your legs (knees off the floor). Your entire body should be parallel to the earth and you will feel deep sensation throughout the core of your body. Continue to breathe slow and even through the nose. Keep an emphasis on moving the lower “floating” ribs inward towards the back body, and then slightly soften behind the heart. Hold 5-10 breaths. Keeping your shoulders steady with your chest facing the earth exhale as you drop your heels to the right, twisting your lower body to active the lateral abdominal muscles. Inhale back to center and drop your heels to the left as you strongly exhale (remember to keep the belly lifted in towards the spine). Return to center with an inhalation and continue going right to left in alignment with your breathing. Do your best to keep your upper body stable and still. Work up to 10 repetitions or more. Lay down on your stomach with your legs hip distance apart and arms extended out in front of you (shoulder distance apart). Keeping your gaze facing the floor, turn the palms of the hands to face each other, and as you inhale lift your right arm, chest, and left leg up off the earth. The emphasis of this movement is not to get your limbs as high as possible, but rather keep lengthening the whole spine and reach your leg long out of the hip and the crown of the head away from the tailbone. Focus your inhalation in the back of the body, thus breathing “space” into the spine. Lower your self back to the floor on the exhalation, but keep awareness into the lower abdomen and gently lift the navel inward with the release. On your next inhalation, lift your left arm, chest, and right leg off the floor and maintain the action of lengthening from the core of your pelvis down the legs and up the spine toward the fingertips. With the exhalation, return to lie on the ground and repeat each side, alternating right and left 5-10 times each. On the last repetition of each side, try and hold the arm and leg up off the floor for 5 slow, even breathes. Emphasize the length of the spine and the gentle lifting of the belly in and up. Finish by sitting back on the heels with the chest resting on the thighs (child’s pose), arms and head relaxed on floor. 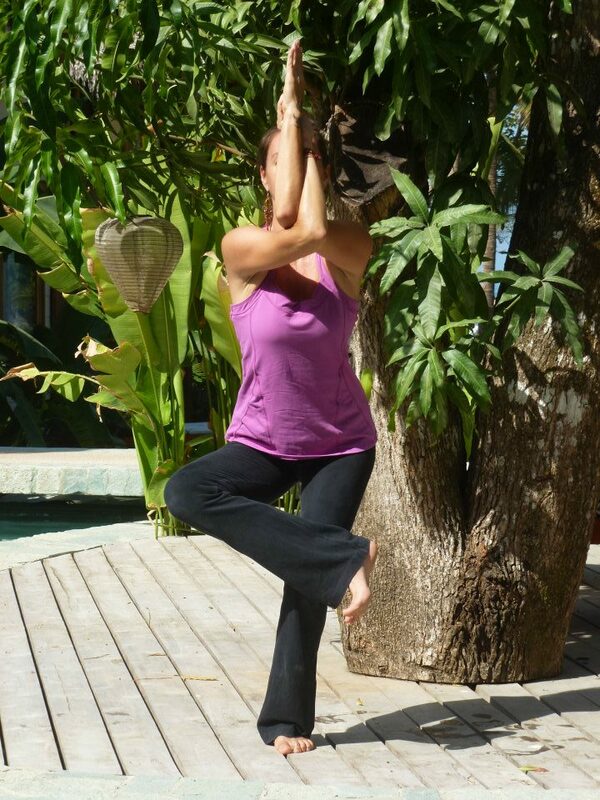 Feel how working with opposite leg and arm can bring more awareness into your “center” and help you to connect with the innate intelligence of the body to stay centered and grounded. Begin seated on the ground with your knees drawn into your chest, grabbing the backs of the thighs with your hands. With the knees bent, first lift up along the spine moving the crown of the head toward the sky and the tailbone firmly down to the earth. Begin to straighten your legs into the air as you release your grip on the hamstrings. As you continue to sit up tall, draw your lower back away from the floor and the sacrum into the body (you will need to fully engage your core as you balance on the buttocks creating a V-shape with your body). Extending the arms parallel to the ground, relax your shoulders and move energetically along the legs from the hips to the toes. Actively lift up along the whole length of the spine, keeping the chest broad and the abdomen fully engaged. Work toward holding this static position for 5-15 breaths. Then bring your palms together in front of your chest (anjali mudra) and actively press the hands into one another. Slightly lift the elbows away from the floor and inhale. Moving with your exhalation, turn your whole upper body toward the right engaging the side abdominal muscles with a twist. As you inhale, return to center and press the hands into each other. On your next exhale, twist as far as you can to the left with your upper body, keeping the legs together and lifted. Return to center as you inhale. Continue to twist right and left on the exhalations, always pausing in center as you inhale to re-lengthen the spine. Build up slowly, and increase the number of repetitions as you feel stronger. If you have less flexibility in your hamstrings or hips, then you may want to bend the knees slightly. 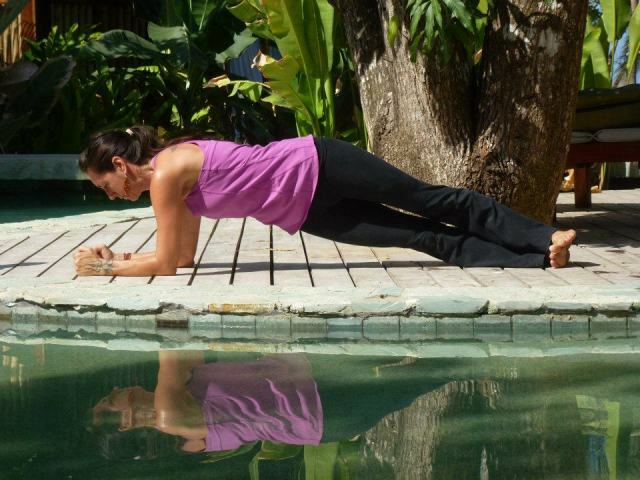 Pranamar Villas and Yoga Retreat in Santa Teresa If you enjoyed this practice and want more, come to the beautiful Pacific Coast of Costa Rica in the surfer’s and yogi’s paradise of Santa Teresa and Pranamar Villas and Yoga Retreat. It’s the perfect blend of surfing and yoga and much more! !